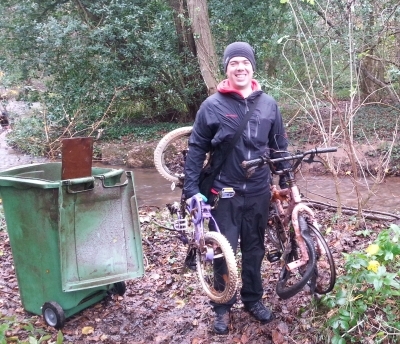 On Sunday 6 December over 20 volunteers took part in a wide-ranging clear-up around the Pentwyn leisure centre. 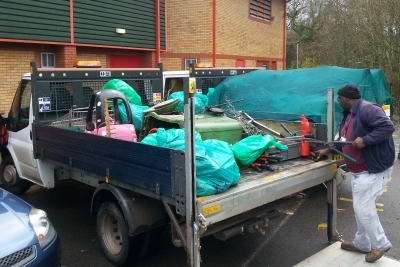 A large amount of litter and debris was cleared from the stream behind the leisure centre, which flows down into the Rhymney. Litter removed included three shopping trolleys, two bicycles, a green recycling bin (no, really), and an artificial Christmas Tree, including lights (not working). 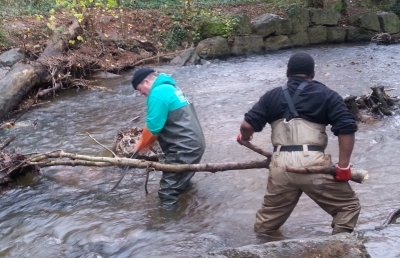 Several blockages, formed by fallen trees and branches, were also cleared, helping the stream flow more freely. And a huge amount of litter was removed from the vicinity — not only the usual bottles, cans, crisp packets and such-like, but also some sacks full of domestic waste (including soiled nappies!) that were dumped next to a public footpath rather than being disposed of responsibly. In total there was enough rubbish to fill two flat-bed trucks. 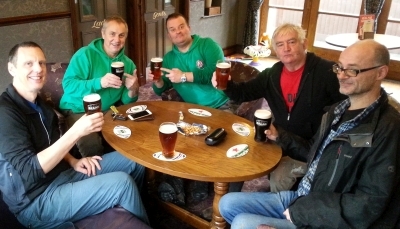 All-in-all, an extremely worthwhile two hours of work… followed by a well-deserved pint!